The health benefits of tea are increasingly established. 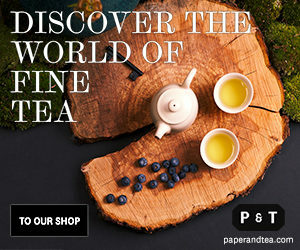 Even discounting the extreme claims of its being a magic cure for even cancer, it seems clear that you are likely to live longer and better if tea is a daily part of your lifestyle. But how about when you reach old age? Is there anything different or special about the value of tea in living well? There aren’t answers readily available. Searching online for teas that are targeted to the elderly draws a blank. The marketing of teas specifically emphasizing wellness have no mentions of benefits for older people. It’s also a topic not addressed in the mainstream of research studies. Hydration: This is a major and too often overlooked health hazard in old age. Water loss is 15% higher than for those under 60, due to decrease in muscle mass and increase in fat cells. Over a third of recorded transfers of nursing home residents to hospital show severe dehydration. Taste buds: In the “prime’ of life, people have 10-15,000 taste buds. In old age, this drops to 7-15. Along with the resulting loss of taste comes a decline in smell and a growing sweet tooth. 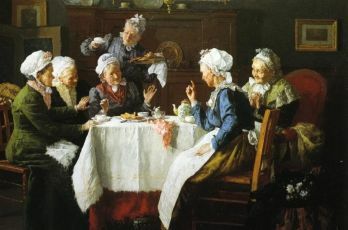 Informal reports suggest that varied and full teas, especially blcak, can counter the tendency of old people to neglect eating. “Mortality hazard ratios”: This is academese for being more likely to die than your peers. A number of striking and well-designed studies make a strong case that among those 60 and older, the tea drinkers have a 10% lower overall hazard ratio. None of this is “proven” scientific “fact.” It’s also not cause and effect, but correlative. There may be many other factors that account for some of the findings. But it’s all well worth knowing and, maybe, personally useful. Caretakers for the elderly sound alarm bells — well, alarm blogs — on the common problem of old people not drinking enough liquid. (It’s one of the ten most frequent admission reasons for Medicare hospitalization.) The 15% water loss from aging combines with decreased sense of thirst and loss of kidney function (progressive from 50 on and often acute at 70) to make this an easily overlooked malady. Many of the elderly are using several medications, some of which are diuretic and others cause sweating. The standard recommended solution is eight glasses of water a day. This has no scientific backing and is too often seen as inconvenient, bloating and just not appealing. We typically get 20% of our water from food. Vegetables and fruit are mostly water. Tea is all water. Contrary to folk wisdom, it is not a diuretic and is equivalent to water for normal hydration. Tea is a an excellent choice for daily hydration. Fruit juices are as effective but tea brings extra boost: it encourages and goes well with food. It offers a wide range of stimulating and sharp flavors that compensate for loss of taste buds. Black teas are reported to be appealing options. Here are examples of studies that report a strong correlation between tea consumption in old age and reduction in loss of verbal fluency, alertness, mental acuity and confidence in problem solving. The researchers admit that there are many other contributing factors, most obviously that tea drinkers tend to have a healthier life style, nutritional habits and attention to sensible daily care. The design of their research samples, longitudinal data collection and statistical tests explicitly address the problems. These are all highly professional A few focus on caffeine and include coffee not just tea. The Cardiovascular Health Study: 4,809 participants, 9 years of follow up. Attenuated cognitive decline for women, no discernible impact for men. National University of Singapore: Just under 1,000 Chinese seniors 2003-2005, follow-up every two years until 2010. 50% reduction in decline across the population. A striking’ but as yet unvalidated, finding that carriers of the APOE e4 gene that indicates gentical risk for Alzheimers showed an 86% reduction in cognitive risk. Japan Ohsaki Cohort Study: 5.7 year study, 13,600 participants. Risk of incident dementia dropped by 27% for those who drank more than five cups of tea a day. An exhaustive meta analysis of seventeen studies (12 from Asia, 2 Europe, 2 USA, and 1 Australia) involving over 48,000 participants. Clear conclusion is that tea consumption is dose-response associated with reduction in risks of cognitive decline, Dose response means there is a linear relationship — drink an extra 100 milliliters of tea (2/3 of a standard cup) and the reduction is 6%. drink an extra 300 ml and it’s 19%. Increase this to 500 and the risk drops proportionately, to 29%. If confirmed, (this is a recent publication, April 2017), that is an astonishing finding. Fruit juices hydrate just as well as tea but don’t provide this extra dimension of wellness. We lose our sense of taste as we age. Literally’ that’s life. Tea doesn’t taste as good as before and it’s easy for old people to neglect eating. They also tend to develop a sweet tooth. They add salt and in many instances enjoy spicy dishes. Enter black tea. Green tea gets most of the press and praise in discussions of tea and wellness. The differences are a subject of never-ending debate and there are areas where black tea is reported as more effective (osteoporosis and blood sugar management, for example). There is one distinctive aspect of black tea: it is bold in flavor, goes well with sugar — which is not the case with green tea — and has many varieties that range widely in flavors: spicy, malty, tippy, brisk, savory, sweet, earthy, nutty , fruity and earthy. 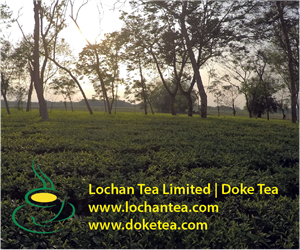 Green tea is more subtle, light, grassy and vegetal. For the elderly with diminished taste buds, that often translates to bland. Tea can help keep you well throughout life. Mortality hazard ratios are a measure of its helping you stay alive longer than your age group average. The figures are complex to interpret and there are many criticisms of the statistical assumptions and methodology on which they are based. They are not absolutes but relative comparisons between two groups. A ratio of 1, for example, would show that there is no apparent likelihood of tea drinkers and non-drinkers differing in frequency of early deaths. A ratio of 0.9 for tea drinkers means that from the data we can be X% confident that they will have lower death rates. It says nothing about timing or number. The studies are consistent in their findings: tea really is good for you. There are no instances of tea drinkers having a higher than 1 ratio in comparisons. In some case – mortality among those treated for acute mycocardial infarctions, the ratio and hence risk is much lower. For cancer survivors, there is no difference apparent enough to justify saying we are confident in concluding that. Call this getting the sign right. In all the studies — hydration, nutrition, cognitive functioning — tea drinkers score better. That seems more important than the details of any specific case study. Retailers: Why on earth are you overlooking this customer relationship opportunity? Brands: You market so many wellness teas, how about messages about us old folks’ wellness? Caregivers, nursing homes: Is tea part of what you make easily available for your residents? Physicians and health advisers: You probably recommend green tea for health, exercise. relaxation. How about Tea for Longevity? thanks, I’ll do that. ?